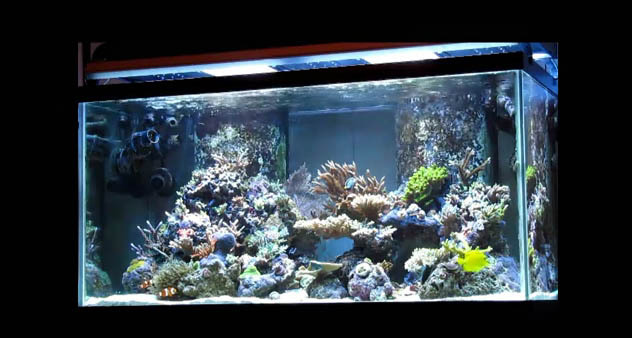 Here is a stunning 120 Gallon reef tank. This dual overflow 120 gallon tank, is absolutely packed with SPS colonies. You will see outstanding polyp extension on every coral in this tank. We can’t give you a complete list of fish in this tank, but we caught a yellow tang(Zebrasoma flavescens), a blue tang (Paracanthurus hepatus), Kaudern’s Cardinal (Pterapogon kauderni; aka Banggai Cardinal), Six Line Wrasse (Pseudocheilinus hexataenia), to name a few. If you see another one, add it in the comment section below. Hey, you should give credit to the person that filmed that video… thanks. Great Video Kray! Beautiful Tank DB!